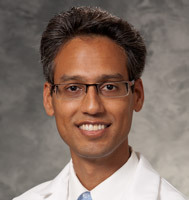 Dr. Ahmed specializes in surgery for complex skull base tumors (meningiomas, pituitary adenomas, and acoustic neuromas), cerebrovascular disorders and neuroendovascular surgery. He also works closely with ear, nose and throat physicians for endoscopic skull base surgery. Some of Dr. Ahmed's research was directed at improving visualization for neuroendovascular procedures. The main goal of this research was to streamline stroke care and assist with clinical decision making while developing a user-friendly interface.